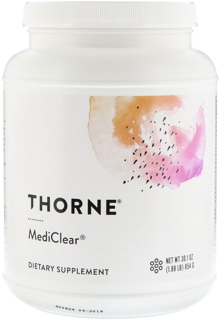 MediClear, a rice-and-pea-protein-based supplement with a complete multi-vitamin/mineral profile and additional GI and liver support nutrients, is the cornerstone of Thorne's detox programs. Environmental pollution, hormone-laden meats, and an increase in the consumption of sugars and the wrong kind of fats have greatly increased the toxic burden on the body. Meanwhile, pesticide-laden and nutrient-depleted vegetables, grains, and fruits often fail to provide the nutrients necessary for detoxification. The liver carries the greatest share of the body's detoxification burden. But the liver needs essential nutrient cofactors to efficiently accomplish its primary task of detoxification. MediClear combines essential nutrient cofactors and specific liver-supportive botanicals, such as green tea and milk thistle, with low-allergenicity protein and the minerals necessary to support the liver's detoxification processes. MediClear contains more protein, fewer carbohydrates, more related detox cofactors, and more special nutrients than most detoxification protein powders. MediClear is also more affordable than other detox formulas and comes in a powder form that mixes with water or juice for a pleasant-tasting supplement. Health-care practitioners know that many challenges to health can arise when a patient's liver is not functioning as it should, such as poor digestion, imbalances in intestinal bacteria, and fatigue. 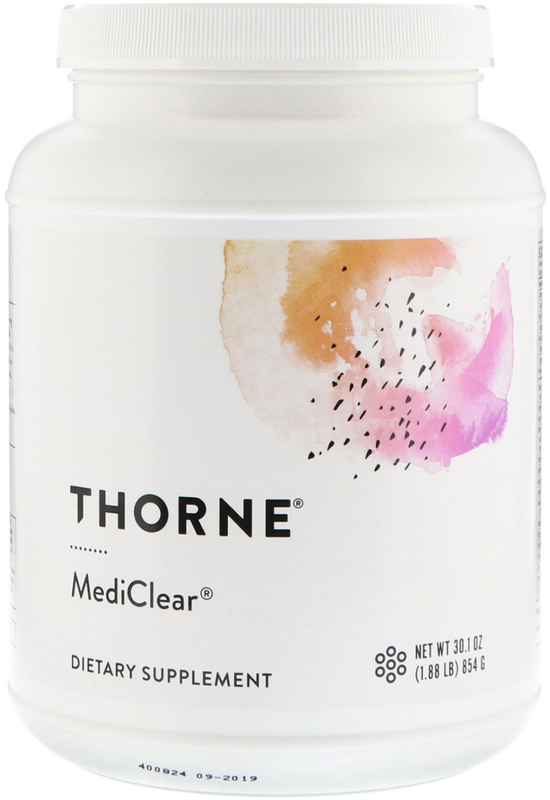 MediClear includes beneficial detoxification nutrient cofactors, as well as an array of extra nutrients and botanicals, including green tea and milk thistle, to support the body during an elimination diet. MediClear contains the vitamins and minerals the support the liver's detoxification actions. These nutrients are provided in the most absorbable, best utilized forms, including pyridoxal 5'-phosphate (active vitamin B6), L-5-MTHF (active folate), methylcobalamin (active vitamin B12), and well-absorbed glycinate chelates from Albion Laboratories. Rice and pea protein are used in MediClear because of their low incidence of allergenicity. It is far more likely for dairy or soy protein to initiate an allergic reaction. Using rice and pea proteins facilitates the elimination of most allergenic proteins from the diet, while maintaining high-quality protein intake.